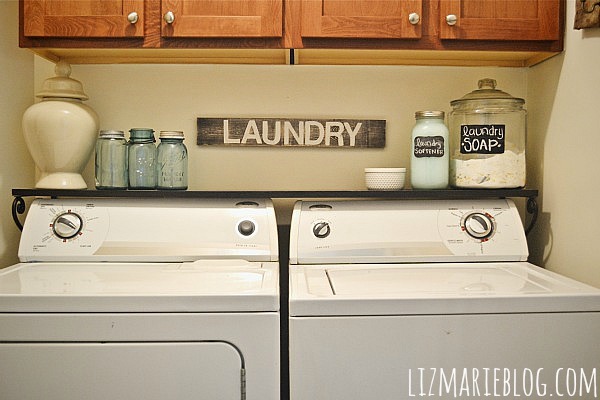 As many of you know, I am obsessed with my DIY laundry soap. Well I was on Instagram & I saw a post by Raising Up Rubies on her DIY laundry softener & I just had to make it myself. I have only used it on a few loads of laundry so far, but I am already in love so I just had to share the recipe & my love for it. It’s a great accent to the laundry soap & makes my towels extra soft & fluffy & they smell great too! O, & since I already had the mason jar, the vinegar, & of course the water, this batch of laundry softener only cost me $1.54. Even more amazing! In a bowl mix the hot water and full bottle of conditioner. Stir until completely mixed & dissolved. After that pour in the vinegar and mix it all together. After that pour your laundry softener into the container of your choice. 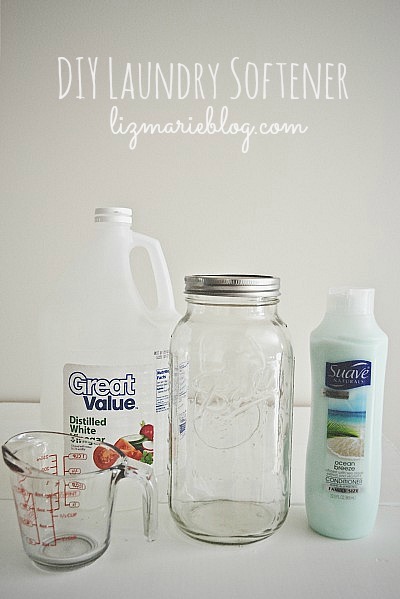 I chose a mason jar because I already had one & this large one is easy to pour or scoop the product out of. I use about 6 table spoons, but you can use the amount that works for you. O, & if you ever thought my handwriting was good… here’s proof that it’s not. It’s terrible. & I don’t mind it. I love the fact that my husbands handwriting is better than mine. I used a chalkboard label that I got from the Martha collection at Staples. 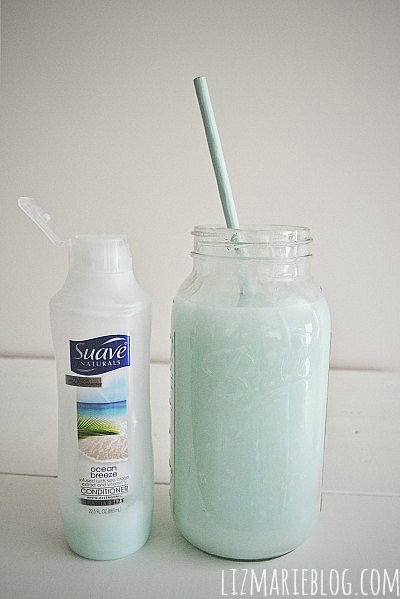 You could use a recycled container with a pour spout, add a pump to the top of the mason jar. So many possibilities & you can do whatever works best for you. I am loving this DIY laundry softener already, but since I just started using it, I will be back later with a full review. Have you ever made DIY laundry softener before? I would love to hear your recipe or things you have used & how you like it! Leave me a comment below, find me on facebook, or chat with me on Instagram, I would love to hear from you! I was wondering when you finished using the product if you still had the same opinion? Also if you’ve continued using it? My husband has a super sensitive nose (especially when it comes to vinegar), is there any residual vinegar smell at all? I use vinegar ALOT – in my laundry – NO residual smell – clothes is soft and fluffy – to clean countertops – smells strong momentarily and then nothing but freshness – and a mix of blue dawn and vinegar (heated) to clean shower stalls – soap scum practically melts off – just smells clean after rinsing! Can you show pictures of how you did the shelf above the washer and dryer? I love this. Great laundry area. Hi, question, can we use it for frontal washing machine ? I was wondering if it’s ok to use in High efficiency washer? I think I missed the part that tells you when and how much to use. Do you put it in your washer – when do you put it in….etc. do you put this right into the washer or in the fabric softener spot? Great idea! Can I ask where you got the laundry sign? What size bottle of conditioner do you use for this recipe? 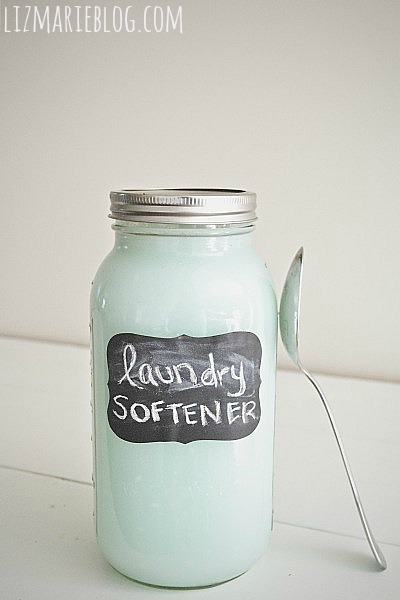 I have been using your recipe for homemade fabric softener. It works great when I put my clothes in the dryer even for a few minutes before hanging them outside. The problem I’m experiencing is that it doesn’t provide any softness to the clothes that I don’t put into the dryer first. My towels and wash cloths are still very stiff once they dry outside. 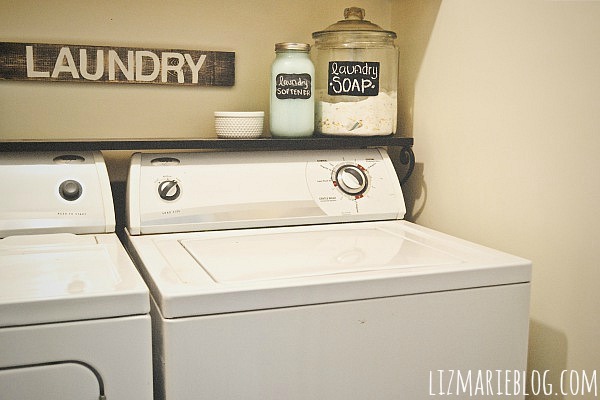 I rarely use my dryer so I am looking for a recipe that will soften my clothes without using my dryer. Does anyone know how I can get my clothesline dried cloth to be soft? I must say you have done a excellent job with this. Also, the blog loads very fast for me on Chrome. Your way of telling all in this paragraph is actually fastidious, every one be capable of easily know it, Thanks a lot. I just could not leave your site prior to suggesting that I really enjoyed the standard information an individual provide for your guests? images to convey your message better, and you can use more text than on a business card. I am in fact glad to read this website posts which includes tons of helpful information, thanks for providing such statistics. Yes! Finally someone writes about insure my iphone 6.
you are saying it. You are making it entertaining and you continue to care for to keep it smart. decks tɦat wіll help players push to Arena 5, ɑnd win. this this web site conations truly nice funny material too. What’s up to all, how is everything, I think every one is getting more from this web page, and your views are nice in favor of new users. I do enjoy writing but it just seems like the first 10 to 15 minutes are lost just trying to figure out how to begin. web owners and bloggers made excellent content material as you did, the web might be a lot more helpful than ever before. Throughout the great scheme of things you actually secure a B- for effort. Where you actually misplaced us was in the facts. As people say, the devil is in the details… And that could not be more true at this point. Having said that, let me inform you what did deliver the results. The text is pretty convincing and this is most likely the reason why I am making an effort to comment. I do not really make it a regular habit of doing that. 2nd, while I can certainly notice the jumps in reason you come up with, I am definitely not confident of exactly how you seem to connect your points that make the actual final result. For now I will yield to your position but wish in the near future you actually link the dots better. You always seem to come out in force in support of the coalitions welfare sanctions and reforms. clarify the approved uses of the drugs and contain advice about possible increased risks of heart attacks and strokes in patients taking testosterone.